“U.S. Secretary of State John Kerry announced on 1st of September that new laboratory results indicate that sarin nerve gas was unleashed last month in an attack in Syria that killed more than 1,400 people – marking the first time a U.S. official has identified what kind of chemical weapon may have been used. Originally developed as a pesticide in Germany in 1938, sarin is a man-made toxin that is similar to a class of insecticides called organophosphates. The chemical warfare agent, also known as GB, is a clear, colourless and tasteless liquid that has no odour in its pure form. It is considered the most volatile of nerve agents, meaning it easily evaporates from a liquid to a vapour and spreads into the environment. According to Daryl Kimball, executive director of the Washington-based Arms Control Association, sarin gas leads to a particularly horrible form of death. “Sarin gas attacks the nervous system, it leads to convulsions, uncontrollable twitching, it shuts down the brain and most die from asphyxiation from just a small exposure,” Kimball explained. How can people be exposed to sarin? The extent of poisoning caused by sarin depends how much a person was exposed to, the length of time of the exposure, and how the individual was exposed. Following the release of sarin into the air, people become vulnerable to exposure through skin contact, eye contact or by breathing air that has been contaminated with sarin. A person’s clothing can also release sarin after it has come in contact with the vapourised gas, which can lead to the exposure of others. Symptoms will likely appear within a few seconds after exposure to the vapour form of sarin, however people may not be aware that they were exposed because sarin has no odour. A low or moderate dose of sarin exposure may result in some or all of the following symptoms: runny nose, water eyes, eye pain, diarrhoea, vomiting, drooling and excessive sweating, rapid breathing, confusion and weakness. 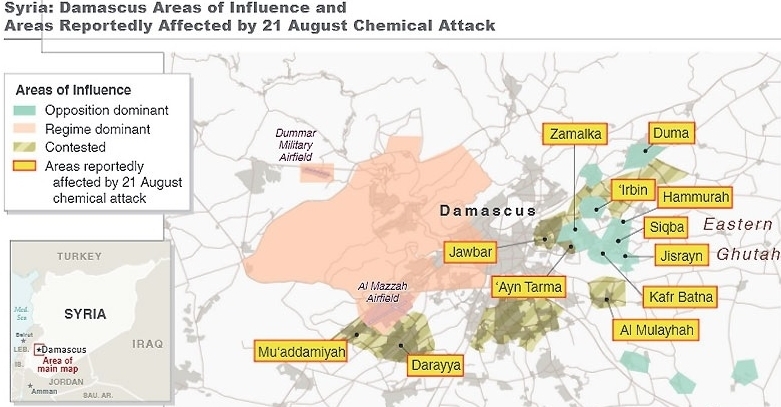 According to the Centres for Disease Control and Prevention, even a small drop of sarin on the skin can cause muscle twitching where the agent came in contact with a person. Exposure to a large dose of sarin can result in a loss of consciousness, convulsions, paralysis and respiratory failure. “It is very clear that from the types of injuries and deaths we saw in the videos that this was an attack consistent with a sarin gas exposure,” Kimball said. When has sarin been used? Sarin and other types of nerve agents were used during the Iraq-Iran war in the 1980s. The deadly nerve gas was also used in two terrorist attacks in Japan in 1994 and 1995. Chemical weapons have been banned in warfare for 90 years. “The revulsion goes back to the terrible experience in World War I with the trench warfare with both sides using chemical weapons on a mass scale,” Kimball said. The 1925 Geneva Protocol outlawed the use of chemical weapons, but not their possession. In 1997 the protocol was replaced by the Chemical Weapons Convention (CWC), which requires the destruction of chemical weapons within a specified period of time. Currently 188 states-parties have signed the treaty. Key non-signatories include North Korea and Syria. The last time chemical weapons were used on a large scale came during the 1980s when Iraqi leader Saddam Hussein used them against Iran. Setting the sarin gas over its opponents and the Syrian people is not only the reason why U.S. is mobilising its troops and allies, but it’s also the drop that spilled the cup. Obeying an international rule of weapons, even though Syria has not signed the treaty is an act against humanity and civilization itself. This can be considered the last resort for the Assad regime to back up their adversaries and to buy time for… For what? This is the question that many people are asking themselves. Vladimir Putin, the Russian president, is trying to prevent any military actions against Syria and he is asking for evidence of the chemical weapons used by the Assad regime. He is considering that an armed intervention is counter-productive and destabilising to the region. UN is the only international institution that can give a clear diagnosis over the issue and everybody are waiting for their report. But the clock is ticking and as time passes the UN inspectors will find nothing but dust over the areas where the chemical weapons were launched.